Amidst insecurity and high inflation, businesses often default or are forced to close down. By creating stable financial systems, Five Talents is helping to rebuild business. Moving from survival to development requires a change in thinking. Learn how financial literacy, planning and inclusion are creating opportunities among the world's poor. Following the national elections earlier this year, political violence in Burundi has contributed to an economic downturn and a loss of investment and aid. Over 200,000 residents have fled to neighboring countries and there is fear of ongoing violence and reprisals. As a result, many development agencies and nonprofits have scaled back or relocated their operations. Meanwhile, the people of Burundi face increased insecurity, higher health costs, and a loss of jobs and business opportunities. Four out of five Burundians live on less than $1.25 a day and each job supports an average of 7 or more dependents. According to Unicef, "The potential impact of the current crisis and an economic downturn on children cannot be underestimated. It could be devastating." Despite these challenges, Five Talents is committed to staying the course in Burundi. Five Talents works with over 25,000 savings group members in Burundi and is pursuing an ambitious plan to expand into another 230 communities. We work with local church partners and leaders, especially in rural communities. Our savings groups continue to operate and expand and are bringing communities together to focus on local solutions. Through small group savings and loans, families are able to access capital in times of emergency and are cushioned against the impact of decreased government funding of social programs. These groups are very grateful for "friendship in times of trouble" and our regional program coordinator, Claudette appreciates the support and prayers of all those who she knows and those who she does not. The knowledge of people who are praying and committed to walking together gives them courage. Join us in supporting families in Burundi. Your gift helps to build peace and creates hope and opportunity for the vulnerable poor. Election results in Myanmar point to new opportunities for the poor. Five Talents is working to spark micro-enterprise development in what, until recently, has been one of the most closed societies in the world. This week's election results points to new reforms in Myanmar, with a broad victory for Aung San Suu Kyi and the National League for Democracy. The election is a milestone in Mynmar's transition from decades of military dictatorship. It is the country's first general election since a nominally civilian government was introduced in 2011. That was the same year that Five Talents began work in Myanmar, strengthening pre-existing savings groups and helping to expand their growth outward into impoverished communities. More than a third of Myanmar's 51.4 million people live on about a dollar a day. Rural poverty is widespread and urban slums surround factories with low paying jobs and an absence of public services. In September, the minimum wage was raised to $2.80 per day. Workers hope for additional changes with the new leadership. Lives are being transformed in Myanmar. The world’s 14th poorest country, local community partners are reporting immense impact from the Irrawaddy River Delta Region to the outskirts of Yangon due to the savings and loan groups, as well as, financial and literacy training. On a recent visit to Myanmar, the program team saw first hand the effects of implementing savings and loan association groups, the thriving partnership with Mothers’ Union and receiving positive feedback from group leaders. Take a tour below of the agricultural community in Myanmar. A woman carries construction wire as she shops at a Delta General Store in Myanmar. 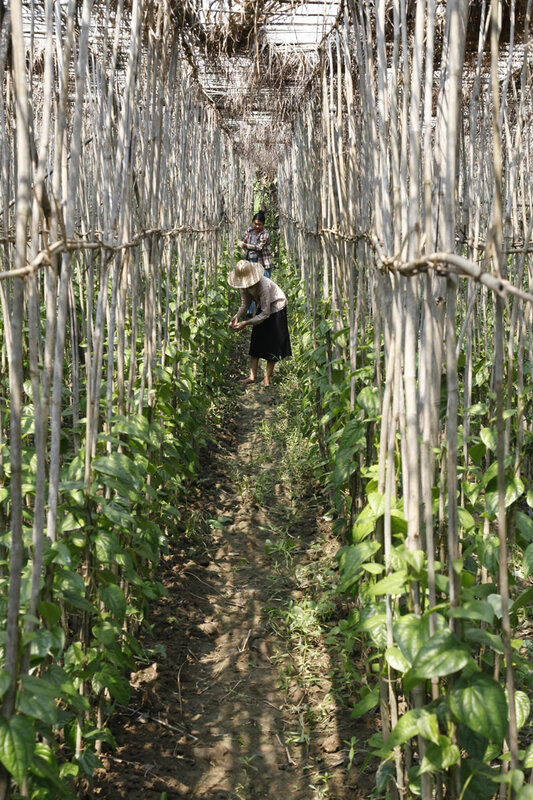 The Delta region of Myanamar comprises almost 20,000 square miles and is populated by 3.5 million people who are mainly farmers. The whole area is low lying (as low as 3 metres above sea level) and was devasted by Cyclone Nargis in 2008 when well over 100,000 people were lost. Red chillies are laid out to dry in the sun, then ground in a mortar and pestle for use in preparing traditional Burmese noodle and vegetable dishes. Crops such as chillies, potatoes, various leaf vegetables combine with various fruit trees such as mango, papaya, banana, etc. provide families with food for themselves and also for sale in local markets of Pantanaw. Women harvest Betal Palm leaves and bamboo in traditional Burmese shade houses in Dyung Daw Galey. The proximity to Irrawady River banks and the inevitable floods each year prohibits growing rice or participation in rice banks. Bamboo is cut, stacked and sold for the purposes of constructing the shade houses. Savings and Loan group leaders gather for a photo before their annual meeting in Chaung Tha. discussing the value of the financial inclusion programs and their hopes and aspirations for the future. Beside the banks of the Irrawaddy river is the village of Dyung Daw Galey. The village is under constant threat from the river which, each year, erodes more of the village land into the river. River floods in this region are a major challenge as they remove acres of land surrounding the village each year. All of the houses in the village have been relocated as far as possible from the river bank as many houses and the village church have already been taken by the river. and flooding throughout the entire living area. Houses are built on poles to maintain a safe height for the occupants. Fish are laid out to dry in a rural Myanmar village before being used to prepare traditional Burmese fish paste. Fish comprises a large part of the dietary needs of the local people. Rice is the main staple. for which there is a ready market in the nearest large town of Pantanaw. The Palm Leaves are grown in specially constructed shade houses to enable ideal growing conditions. Help us support more entrepreneurs in Myanmar. Make a donation to Five Talents today. Have you ever wondered why Five Talents works where it does? Since the organization's founding in 1998, Five Talents has focused on serving communities that are off the beaten path. They are often post-conflict, rural and far from the nearest bank. These communities have under-served populations stuck in poverty. Starting a savings group, offering micro-business loans and organizing training workshops -- these are services that such communities need desperately if fathers and mothers, husbands and wives are going to see real transformation in their lives and in the lives of their children. For an example of why we go where we go, look no further than our Myanmar program, which was launched in 2011. The figures come from a recent report by UNDP, CENFRI and Finmark Trust titled Making Access Possible (MAP) Myanmar. "Access to an appropriate portfolio of financial services can improve the welfare of the underserved population by helping them conduct their financial lives more efficiently, increase income, manage risks and build up wealth over time," reads the report, which was based on surveys and interviews of people in over 5,000 households. Five Talents is beginning to help meet this need through its partnership with Mothers' Union. The early stages of this partnership has focused on establishing savings and loan groups in the mostly rural and undeveloped Irrawaddy River Delta region, and in the hot and humid outskirts of Yangon. Some of these groups are creating joint agricultural enterprises – an innovative approach that has proven to be remarkably effective. Local community leaders in the country, the world's 14th poorest, see the program as transformative – not just at the individual level, but also at the church and community levels. While change is taking shape across Myanmar, Five Talents programs continue to expand reaching refugees, rural farmers, and other marginalized groups across the country. Decades under the repressive rule of a military junta have sapped many women and men in Myanmar, or Burma, of the skill-sets and savvy needed to pursue entrepreneurial, income-generating activities. Furthermore, leaders in Myanmar's Anglican church, which Five Talents also partners with, had been -- until recently -- reluctant to encourage members to pursue "business" opportunities. "Money is difficult because it might cause some problems in the church," said Ethel, who works with savings group members in Pyay, and whose husband, Clement, is a pastor. "It might cause people to separate or fight, so the church has [been slow] to recognize its value. I try to explain that God wants us to save money and do business [to provide for our families]. Finally, people in the church have begun to recognize the value." Five Talents works with local partners across many different cultures and countries. Each under-served community is different and requires a nuanced, tailored approach to micro-enterprise development. Myanmar is no different. 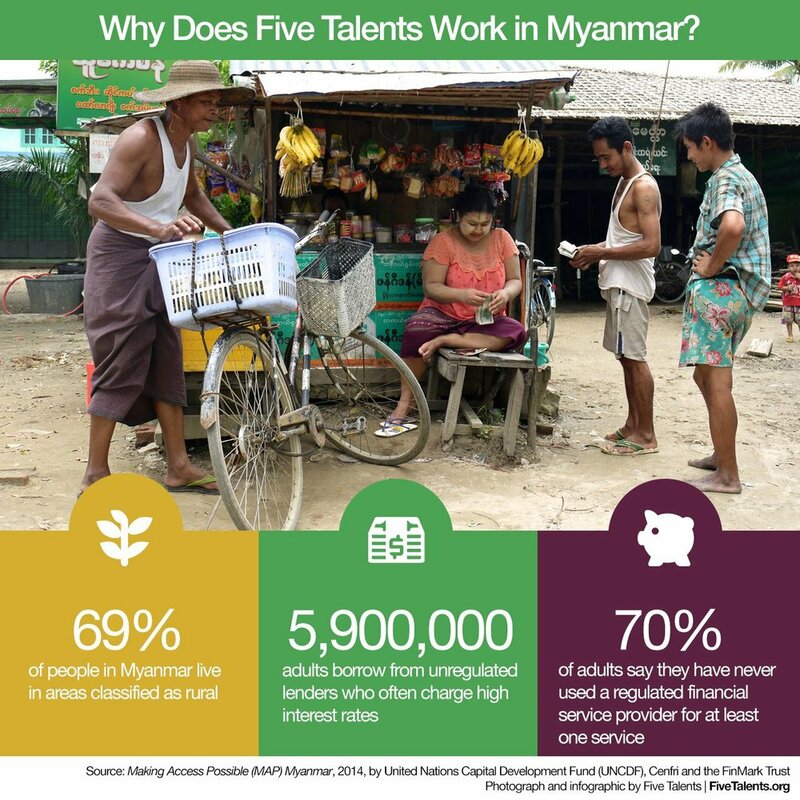 The early stages of Five Talents' partnership with Mothers' Union in Myanmar has focused on establishing savings and loan groups, or "associations," in the mostly rural and under-developed Irrawaddy River Delta region. Some of these groups are creating joint agricultural enterprises – an innovative approach that has proven to be remarkably effective, given the context. Moreover, church leaders across the country are on-board and are encouraging members to participate. They see the program, which began in 2011, as transformative – not just at the individual level, but also at the church and community levels. It all begins with business skills training workshops like this one – and with an emphasis among participants on building up savings. "Sometimes it is hard to save even 1,000 kyat ($1.03) every month," said Ethel. "But I encourage them to find money for that amount – through a small business or a small chicken farm, or something." Out of the groups' savings, members lend to one another. The 3% interest rate on the micro-business loans is returned to the group's collective savings, "liberating" the members, Ethel says, from having to borrow from local money-lenders, who often charge exorbitant interest rates. Helen, one of the group members present during Sonia's budgeting workshop testified to the benefits of building up savings and taking out small loans to support new income-generating activities. "My life has changed," she said. "I can produce more because I have more capital." PATHEIN, Myanmar - City dwellers in Yangon, Mandalay and Pathein are feeling the impact of the government's ongoing political and economic reforms. Real estate prices are rising. Traffic is growing. Visitors from all over the world are pouring in. But folks in rural areas of Myanmar still have little to show for all of the historic changes that are making headlines around the world. On Tuesday, women and men representing three Mothers' Union savings groups in the Irrawaddy Delta area of Myanmar shared about their lives and discussed how taking part in the joint Five Talents-Mothers' Union microsavings program has begun to benefit their families. All of those present on Tuesday are involved in agriculture, growing either rice or betel plants. Some had seen their crops destroyed by recent flooding. Group members said the microsavings and business training program has given them more skills and capital, and they came on Tuesday eager to develop some ideas for new income generating activities. After hearing stories about micro-entrepreneurs in other parts of the world, the women and men began to brainstorm ideas for new income-generating activities. Five Talents Executive Director Sonia Patterson, in Myanmar on a program visit, led the informal workshop. Before the day ended, savings group members had also participated in a budgeting exercise that helped them evaluate their management of both family and business finances.